From Mad Alchemy’s Pete Smith: “I came across this essential oils blend and it immediately reminded me of the Holidays. Pat, my mother-in-law, used to make the most amazing holiday tea drink, Russian Tea. I love everything about the tea, but the aroma is what has really stuck with me. Cinnamon and clove undertones with a nice spiced citrus bouquet. 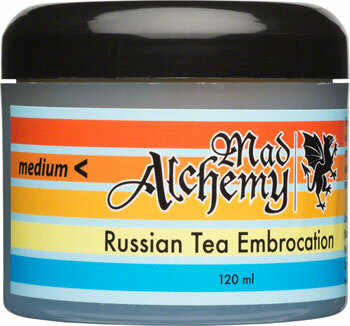 Russian Tea does still burn, with a medium heat intensity and contains the same great beeswax, grapeseed and soybean oil base as the other MAE products. I really love this stuff. Russian Tea is the Mad Alchemy I use on race day. Ideal for temperatures between 30 and 65 degrees.